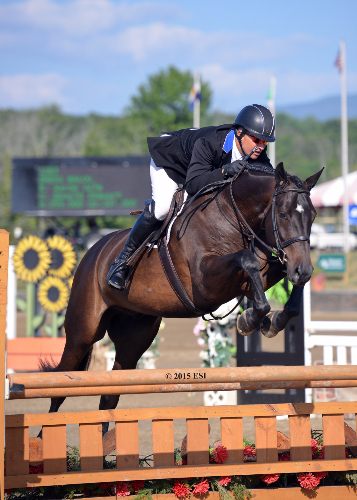 SAUGERTIES, NY (September 9, 2015): Championship Sunday at HITS Saugerties began with the high-energy concluding round of the richest Hunter class in the country, the Diamond Mills $500,000 Hunter Prix Final. Aaron Vale, of Williston, Florida, and Dress Balou, owned by Donald Stewart, did it again, winning their second consecutive title in the renowned event to secure a reign at the top. Vale’s game of cat and mouse with Victoria Colvin, riding Dr. Betsee Parker’s Inclusive, ignited in Friday’s first round and continued through Saturday’s second round, going back and forth with the leading scores, and both were guaranteed an appearance in the top 25 on Sunday. “She [Colvin] was a smidge ahead of us going in there and out of the two preliminary rounds, she beat us once and we beat her once. So we knew she was the one to go after,” said owner Donald Stewart. Sunday’s round three offered the top 25 competitors a clean slate from their previous scores and the fresh start was the perfect way to impress the judges and move up in the ranks. The class began but it wasn’t until the fourth entry, Patricia Griffith of New York, New York, and Akinda, owned by Hillside Farm LLC, navigated the course set by Rian Beals of Saugerties, New York, that the competition heated up. They were careful in their movements finishing with scores of 85, 86 and 88 for the lead with a total of 259. The attempts continued throughout the order, but no one could touch Griffith at the top. That was until Adrienne Iverson and Reliance, owned by Brook Run Farm, LLC, strutted into the ring. Steadily they completed the course with scores of 85, 88 and 89.5, totaling 259, and just enough to tie Griffith. Twenty-fourth in the order, Vale was confident in his craft and led his six year old mount to scores of 89, 91 and 89 for a total of 269 and the lead. Colvin was last in the order and she topped the charts with a high total score of 271, the result of a 91, 87 and 93. The top four had one last round to give it their all and either Colvin, Vale, Iverson or Griffith would be crowned victorious. First in the round four order, Griffith finished her round with a total score of 258, and an overall score of 517. She was followed by Iverson who sailed to a total of 262 and an overall score of 521 to best Griffith by four points. Spectators grew quiet as Vale entered next and gave his everything in attempt to make up for the three points between him and Colvin after round three. Careful, with just enough presentation to catch the attention of the judge’s panel, he exited the ring as a total score of 268, and a 537 overall, echoed through the show grounds. Colvin was next and the crowd grew silent again as she met every fence in stride. She piloted her way through the course to earn a total of 264, but it was not enough to top Vale. Her overall score of 535, just 2 points behind Vale, for the red ribbon. “Going into the last round I kind of opened the stride in the gallops, showed a little more pace. I wanted to show off and catch the judge’s eye a little bit,” said Vale. Aaron Vale and Dress Balou on their way to a Diamond Mills $500,000 Hunter Prix Final win at the HITS Championship. Proving perseverance pays off, and moving up from twenty-fifth place in 2014 to first in 2015, Margot Peroni of Califon, New Jersey, and her own Orlon, emerged triumphant in the four-round Platinum Performance $250,000 Hunter Prix Final, taking home a $75,000 share of the prize purse. After Friday’s two preliminary rounds, over a course designed by Rian Beals, the top 25 competitors moved on to Saturday’s two round challenge. All of the riders were hungry for a win, but only the top four would return for one last go at the course. First of four in the order was Oliva Hellman aboard Sabrina Hellman’s Woodstock and they cruised through the course to receive scores of 85 and 82, for a total of 167 and 333 overall. Next it was Jacquelyn Maggiore’s turn, riding her own Contina. Having received scores in the mid-eighties in the previous rounds, the final round proved to be tricky for them, leaving with scores of 73 and 75 for a round total of 148 and 315 overall, for fourth. Kimberly Maloomian and Invincible, owned by Ellen Toon, were third in the order and besting the two prior trips, they took the lead with scores of 82 and 87, totaling 169 and 339 overall. The final trip of the day belonged to Peroni, who didn’t make the final four in 2014 due to Orlon’s green moment. But now, one year later, they were ready to take the final. “I saw the end of Kim’s round, and her scores came in and they were good but they weren’t what I know Kim can do, so I knew we had a shot at winning,” she continued. Peroni gave it her all and delivered more than a smooth round - she gave an exceptional performance for scores of 87 and 87, totaling 171, 343.5 overall and the win. “I thought that she had a wonderful rhythm and pace going. She never deviated from it. I just thought her horse jumped so well,” said Judge Jimmy Lee. “I like that Tom has kept the traditional judging format which allows the judges really reward the classic, traditional hunter round. I think that is very important,” added Lee. Margot Peroni and Orlon win the Platinum Performance $250,000 Hunter Prix Final at the HITS Championship.